Your garage floor may be harder to keep clean than any other area of your home. You drive hot rubber over it every day, oil and other automotive fluids drip on it over time, and all manner of dirt, mud and rocks are tracked in on your feet. In Gilbert, scorpions and other critters like to hide away in the shade of your garage, and they can litter the floor with special “gifts,” as well. Concrete garage floor coatings can help protect it, but you have to choose the right coatings. Gilbert AZ concrete stain is a perfect choice. 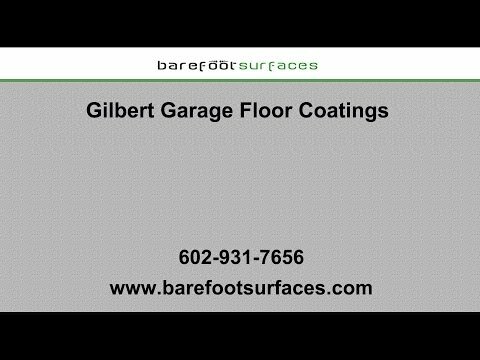 Here are a few ways that putting a concrete stain on your Gilbert garage floor will benefit it! The most obvious benefit of concrete stain is that it makes your garage look better. Instead of a dingy, grey floor that is marked by splotches of oil and other dirt, you have a glossy floor in just about any color you want. You can even put a mottled pattern into the floor design. Concrete stain can make your garage floors look as good as the floors in your kitchen or any other room in your home. The glossy surface will also make the floor easier to clean, though you will have to invest in sealing the floor to get it. Many homeowners try to go with the cheapest route possible and just put a coat of paint on the floor. Not only will this actually look pretty bad — have you ever seen painted concrete? — but it will also be a temporary solution. Paint peels up from a garage floor rather quickly for a number of reasons. Moisture vapor can move under the paint and cause it to bubble up, and the hot rubber from your car’s tires can peel it right off. Caustic chemicals like motor oil and cleaners can also strip it from the floor. You’ll have to repaint the floor every few months or so to keep it looking good. Concrete stain is easier to apply than most other garage floor coatings. It is more forgiving as it spreads and blends quickly, and it doesn’t require a multi-stage application process. All you need to do is clean the floor of dirt and oils first, and then apply the stain with a foam roller. After about an hour, the stain will be dry enough for you to walk on it. You’ll have to wait another 72 to 96 hours for the floor to be ready for your car, but the time depends on how much humidity you have and how warm it is outside. Concrete stain will stay on your garage floor for many years if it is properly applied. The most important part of the application process is ensuring that the floor has been properly cleaned. Lingering motor oil, grease, and other chemicals can prevent the stain from making a proper bond, and it can degrade more quickly. Sealing the stain will also help it last even longer and give it an attractive shine. Over time, the stain will degrade from foot and car traffic just like any garage floor coating, so sealing it will lock it in and protect it. Sealing it will also make it easier to clean. You can just sweep up dirt or wipe away oil with a soft cloth or mop. Hiring a professional to install your concrete stain or other garage floor coatings is key to their longevity. Barefoot Surfaces specializes in Gilbert outdoor epoxy flooring, stained concrete, decorative concrete overlays, metallic epoxies, sealed concrete, and other garage floors. With our gorgeous garage floor coatings, you can turn your garage into a beautiful space that you’ll want to be in. Your garage won’t just be the dingy, dark place where you throw your lawn equipment and other things you aren’t using. We also sell Gilbert garage cabinet systems so that you can completely overhaul your garage and get more out of it. Browse our catalog online to see our garage floor coatings and other offerings, or contact us with your questions or your custom requests.